So I say this a lot, but I reckon that if I was staring down the barrel of my last meal it would have to be this ‘almost’ Caprese salad……ahh who am I kidding, its good but it ain’t that good…gimmie a bacon bap and I’ll take the bullet no quibbles……and a lamb curry……..or a chicken pie……ok I’m stopping here. 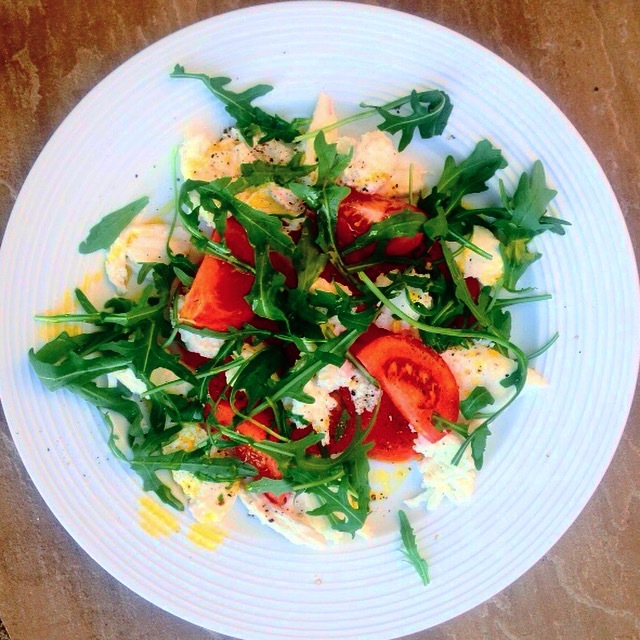 But, in all honesty the might Caprese is a thing of wonder and beauty but only if you have exceptional ingredients – there is absolutely nowhere to hide with this salad, all the elements need to literally knock yer socks off if one fails to pull its weight……well…..do you have a dog? Chop up the tomatoes roughly, throw on a bright white plate. Rip up the cheese and sling onto the toms then scatter over the fresh rocket. Finish with lugs of rapeseed, lemon juice and crack black pepper. I’d recognise the photo faux pas. It’s rapeseed oil, not olive on the lens. Lovely all the same. “Throw it on a bright white plate…” HA! Love it! Lovely salad, too.